Recently a bug was revealed in OpenSSL, called Heartbleed. One of the very unfortunate aspects of this bug was the potential for all passwords and cryptographic keys on a server could have been dumped to any hacker who knew about the flaw. As users, we can't control the cryptographic keys; however, we can control our passwords. I was able to quickly identify my key accounts at risk in order to reset each password. How? With a password management database, KeePass. I also had help from the well-documented Mashable article. 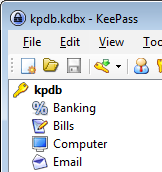 I have all of my passwords stored in a KeePass database. Each account is categorized into groups like Banking, Email, Investments, etc. (see screenshot above). Using the Mashable article, I edited the each description by adding "OpenSSL" for each account that used OpenSSL. I also ran a few online searches to determine the status of other accounts I wasn't sure about. Once I finished that, I search through the entire database (over 240 passwords!!) for "OpenSSL" to list all the entries together. Starting with my financial accounts in Banking, Investments, and other categories, I changed each password, one-by-one. It took about an hour, but who out there without a password management database can say they reset all their key accounts so quickly? Now I'm not going to stop there. I'll be reseting some passwords once a week until I hear this issue is cleared up. (Thus entering "OpenSSL" permanently in each account description.) It's going to take time to re-issue those cryptographic keys and for all the certificate authorities to synchronize. For these important accounts, I don't want to risk losing control. Start by entering your most important accounts and change the passwords to random passwords. Gradually add those you don't use as frequently or are not as important. Then set a schedule for each important password to expire on a regular basis: every 2 months, 6 months, or whatever you think is best for the account. My financial accounts are reset every 3-6 months. Hopefully webmasters, server admins, cryptographers, and anyone else involved in this ecosystem starts to realize that we have a broken internet. Encryption technologies are failing and need a serious upgrade. In some places, we don't even have encryption, and it's harming trust. It's up to the gatekeepers to keep us safe and to promote trust - we users can only do so much.